How many times have you tried to teach someone something and they just don’t “get it”? They watch you do it, but then can’t repeat it. That’s because the human eye can’t “SEE” something that the mind does not understand. LET ME REPEAT THAT… The human eye can’t “SEE” something that the mind does not understand. That really is the CORE point of the SoccerU series. We break it down and explain it to your mind… so that your eyes can actually see it and the body can learn it. With that thought in mind… watch the previews and you’ll understand how this series works and why it works so well. 3 years…. yes… 3 years of my life was devoted to developing, shooting, editing, and producing this series. Why? Because none of the “youth soccer videos” on the market “got it”. They didn’t understand that step #1 was to break down the skill to its BASIC fundamentals first… then show how to teach it. Then show young players, advanced players, college players and professional players ALL working on the same skill. Too many of them just show players doing drills. It is my opinion that most youth soccer training products start off as a way to make money. A “marketing tool” if you will. Then they build content around that idea. SoccerU is different. I completely designed this series based on the concept that you have to train the trainer… then let the trainer train the player. Sometimes the trainer is a coach, sometimes a parent, and sometimes it’s the PLAYER training themselves. It has become a #1 seller because of it’s CONTENT… not its marketing. I 100% guarantee that your soccer player will not be exposed or taught more than 50% of the skills shown in these videos. Even if they spend years playing at the top levels and attend all the camps they can… THEY WILL NOT BE TAUGHT THESE SKILLS. The division one college players I work with all say the same thing… I wish I had this series when I was growing up and learning. 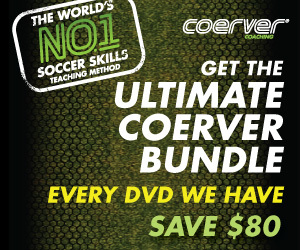 The SoccerU and Blast the Ball series has been one of the TOP selling series in the WORLD for years. it has helped 1000’s and 1000’s of players, coaches, and parents. We have 100’s and 100’s of emails thanking us for producing this series and telling us how it has helped.